At the hearing more than 30 Fast Food and other workers testified about their inability to survive, live, and afford housing on the wages they earn under the current economic scheme. 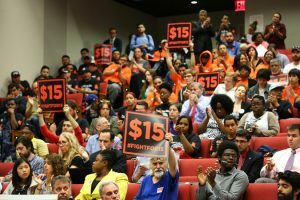 They, boldly, are seeking an increase from $8.75 per hour to $15 per hour in order to offset the economic disparity between their wages and their cost of living. NYC’s Mayor, Bill De Blasio, and Governor Andrew Cuomo have been vocal advocates of this historic increase for the 180,000 Fast Food workers residing and working in New York State. Despite the opposition of major employers over the alleged adverse economic impact of these significant wage changes it is expected that increases will be announced shortly. The Los Angeles increase seems to have been the momentum shift these East Coast workers were looking for.